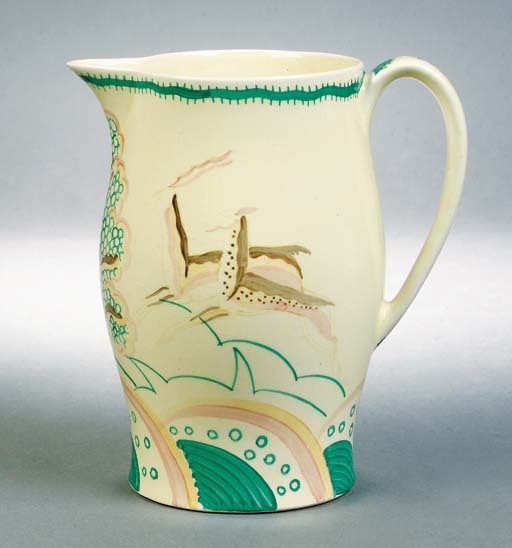 Susie Cooper, along with Clarice Cliff are probably the most significant figures in ceramics design of the Art Deco period. Susie Cooper was born in 1902 in Staffordshire and joined A.E Gray and Co. Ltd, a Burslem based pottery specialising in pottery decoration, in 1922. Pictured right: A Susie Cooper Grays Pottery leaping gazelle jug – sold at Christies, London, July 2000 for £411. After a short period as a production line paintress, her talent was recognised and she became in 1924 the firm’s resident designer, remaining until 1929. It was her daring use of bright colours and geometric banded patterns that became her trademark – her mark, was a leaping deer and after 1932 included a signature and the wording Crown Works. company Wood & Son to produce them. Pictured left: A Susie Cooper 8078 Tea for Two sold at Christies, London, June 2006 for £1260. Her initial workforce of five paintresses increased to forty within the first two years. Her modern designs consisted of stylised flowers, spiral motifs, simple banding and sgraffito (where the design was cut into the glaze). To compliment her designs she created successful shapes including ‘Kestrel’ and ‘Curlew’. Demand for her stylish shapes and patterns was so great, hand painting was supplemented with lithography and lithographic transfers. New shapes and patterns emerged including the ‘Falcon’, ‘Rex’, and ‘Spiral’ shapes, and tranfer patterns such as ‘Acorn’ and ‘Nosegay’. In 1940 Susie Coopers influence and work were recognised, and she was given the award of Royal Designer for the industry, and was later awarded an O.B.E. Susie Cooper died on the 28th July 1995 on the Isle of Man. She had a profound effect on ceramics design from the 1920’s to the present day. 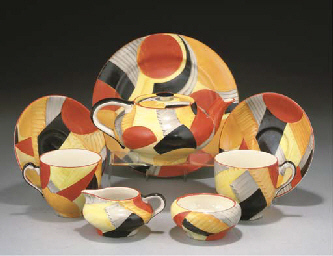 The influence of her shapes, designs and patterns are still very evident in ceramics today.